Склонённый ленточный конвейер серии SCI используется в основном для доставки продуктов, он может эффективно повысить эффективность работы и защиту внешнего вида продукта. Также он может быть связан с внешним сигналом, и реализовывать автоматизацию с применением роботов. Introduced high strength aluminum alloy manufacturing, anodization of sand blast, elegant appearance. 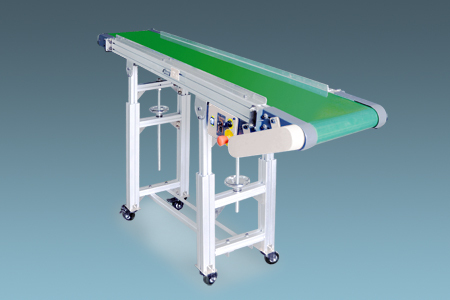 The workbench is made of high quality rubber materials to protect product's external appearance. The height of two ends can be easily adjusted by using handwheel. The bottom adopts universal casters with brake castors to make fixing and moving much easier. The knob speeder can adjust freely, operate easily, convenient to use. 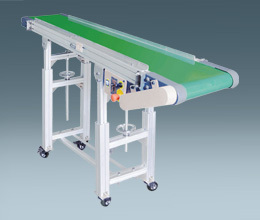 With automatic and manual switching function, and not only can move with robot, but also work independently. Add robot standard connector, conveniently and quickly connect with robot.